The nut is part of the ukulele where the strings start at the top, between the tuners and the fret board. The width of the nut varies slightly by make and model and affects the feel of the instrument. A wider nut gives a bit more space between the strings, while a narrower nut makes the strings a bit closer together. Nut width is very much a preference thing. Just because you have big fingers doesn’t mean you need an extra wide nut to play the ukulele – anyone can learn to play any standard nut width. I don’t have particularly fat fingers, but I prefer a wider nut. Some players say a narrower nut gives them more speed. This aspect of a ukulele’s specification is minor enough that most dealers don’t even mention it, making it hard to narrow down models when nut width is an important factor for you in selecting an instrument. To that end, I’ve scoured the web for this information and included it here. I’ve tried to find at least two confirmations of each of these, but some are harder to find than others. 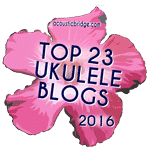 If you own a common ukulele brand not listed here, please measure the width of your nut and post it in a comment. Likewise, drop a comment if you can confirm one of these where I’ve only found one confirmation. Wow – I’d never heard of that model. Added! Thanks! I have this Uke. It’s a tenor and I can confirm it has 1.75 inch nut. I love it. I bought this model (Oscar Sch. OU6W) After playing a Kala Tenor and Oscar Schmidt Concert with a (‘standard’)nut width of 1.375. I had played these other ukes for about a year before I bought the 1.75 nut width. I ended up returning the 1.75nut width. I felt that that would have ‘started all over again” if I would have kept it. Even though my large hands wants a little more than 1.375 of nut width, I was used to playing it somewhat proficiently. I would only recommend this model(OU6W Oscar) IF it was the first uke to be bought. Thank you for your work, I’m surprised nut widths are so little publicised aand that most brands don’t come with at least one wider neck option. I just watched a youtube review by an owner of a custom uke that is made with 1.5″ nuts. Thanks for your comment and that video link, Dennis. I do find a wider nut makes a huge difference and wish they were more common. Just checked out an Amali Zebrawood UK330 in soprano with 1.5″ nut at South Austin Music here in Austin. Interestingly, though the nut was narrower on the Flea, the Flea’s very low action and low resin frets, coupled with the same string spacing as on the Amali, made it as easy for me to play fringer-scrunching D chords as on the Amali. They have the best selection in Austin. I wasn’t able to find any wide neck ukes at any other stores and this is Music City! What’s a big fingered uker to do? Oops, that’s Amahi, not Amali. It would also be useful to chart the string spacing measurement as well, i.e. the measurement from 1st to 4th string. My Islander SA-4-T has 1 1.5″ nut width. So does the Cordoba 23T. Cordoba 20T is only 1 3/8″ though. Cordoba is actually really good at publishing their specs on their website for each instrument. Related to Terry’s comment above, I was trying a Martin soprano and the string spacing felt so much more roomy, despite only a 0.8mm difference in nut width compared to the Kalas in the store. Next time, I’ll check to see if the strings are set wider in the nut as well. I tried that Oscar Schmidt with the super wide nut and it just felt weird. I guess you’d get used to it and it’s such a personal thing you have to go with what you like. I don’t mind a narrow nut on a concert or tenor scale, but I really appreciated the extra space on that Martin Soprano I tried. I don’t own any ukes with a soprano scale, so it’s also a matter of not being used to it. I specifically looked for the 1.5″ nut on my tenor as it felt more natural coming from a guitar background. Now, I actually prefer my 1 3/8″ concert-neck soprano. I have a Cordoba 25CK and the nut width is 35mm. The Cordoba’s string width is almost as much as the Islander even though its nut is the same size as the soprano. Nut width likely going to be an indicator of string width, but two ukes with the same size nut might give different string spacing. Yes, I think string width is much more important than nut width. E.g., my Kala tenor’s nut is 0.6mm wider than my Martin tenor, but the Martin’s strings are 1.1mm wider than the Kala’s! The difference seems to be how much fretboard is “outside” the strings. That space doesn’t affect my playing, but the string spacing does. Caramel CS400 1-3/8″ nut. Thank you for your effort! I have a restored 1920s Stromberg-Voisinet banjo ukulele wirh a fingerboard that is a little under 1.25 in, maybe 1 3/8 … the choice was whether to have the strings so close to the edges that they can slide off or so close to the center that it’s hard to finger one string at a time! Sorry my phone doesn’t let me upload a picture here. Leolani have a width of 38 mm, even the sopranos. Just bought a Oscar Schmidt OU5, which I thought had 1.5 in nut, but actually measures at 1 3/8. However, string spacing at nut is 28.6mm so I think I’ll manage.